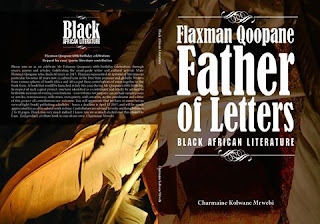 A new book paying tribute to South African writer, Flaxman Qoopane, is out. The work contains many essays and articles on Mr Qoopane. Hector Kunene : a great African writer? This is a perfect moment to celebrate the great work of Ntate Qoopane. writers came together to write a wonderful pieces and combine it in a form of a book to highlight the journey of Mr Flaxman Qoopane in the Literature industry. Pula Nala. This is some splendid news, I can't wait to have the book in my hands already. Big ups to all those who contributed in honouring the great Old Man and his suberb work over the years... The Daily Sun Man sure deserves to be celebrated. Word is bond.